Today I am going to, one, share my story, if you are in my email list or you may have heard some of the previous podcast episodes where I alluded to or told you that I have just recently quit my day job, and I’m being a full-time homesteading mama and blogger and author and, of course, podcaster. I wanted to share with you the steps and some of the things that my husband and I had been into place and doing in order to get us to this point. For you, it may not be that you’re wanting to quit a day job and do something else, but it may be that you need to get your finances in order, it may be that you’re looking to go down to maybe one income. Listen to the Pioneer Podcast! Whatever it is, I think no matter what the situation that you are in, these tips and my story will help you to save a little bit of money, set some aside for something fun or a family vacation or maybe, in our case, it is to start to pay off some debt and to get yourself set up so you don’t have to have that extra income. Let me back up a little bit for those of you who may be new or to give you a little bit of backstory. I have been a pharmacy tech for over 18 years. I started right out of high school. I also grew up as a homesteader. I’m a fifth generational homesteader, my family has always lived close to the land up in the mountains, raised their own food, put up food, and been very self-reliant. Growing up we always had our own beef. My dad has always raised his own cattle and we’ve always had a big summer vegetable garden my mom always canned. She always cooked from scratch. A lot of it was out of necessity, so my dad, when I was growing up, was self-employed. He was a logger. We live in the Pacific Northwest, back then it was at the height of the timber industry. It’s not so much the case anymore, and he’s now since retired, he just had his 80th birthday this past year, but when I was growing up that was what he did. Because we were self-employed, sometimes, if you’ve ever been self-employed, sometimes things go really good, and sometimes they don’t, and we never without. We were always well-provided for, but there wasn’t always a lot of extra money. A lot of the times, my mom, out of necessity like I said, we had our own beef, chicken was something that we had very rarely, same with fish, because that wasn’t something, when I was growing up, that they raised themselves at that time. I was already raised doing a lot of this stuff. When my husband and I got married, I went to work in the pharmacy like I said, and we started doing more and more of raising our own food and putting it up and really just delving deep into this lifestyle. He wasn’t raised in this lifestyle of having a garden and canning and dehydrating and raising your own food, and that type of thing, but he quickly jumped in and does more with the animals, honestly, right now, than even I do. It’s a great team, and he really adapted to this way of life, which that is probably going to be another upcoming podcast episode, because I’ve had some questions about that working together as a family and with your spouses and how that all goes. That will be coming up. Almost two years ago now, I really felt that my husband and I, looking at our finances, that I really wanted us to get out of debt. We don’t carry credit card debt. We have a credit card, but it’s something that we’ve used and always paid off every month to garner points or whatever. We don’t carry a balance on it, so I don’t ever have to pay interest and whatever we put on, we’re able to pay off in its entirety. We’ve been very, very blessed and fortunate that way. We had vehicles that we got a loan to get, we had a camper trailer, and, of course, we have a mortgage on our home, we don’t own our home outright, and we also had medical bills. We do have medical. We’re very fortunate that we have medical, but we have some deductibles and just some different things. My daughter Von Willebrand’s disease, which is a blood-clotting disorder and so when we finally got that diagnosed, we had a lot of medical bills to pay off due to lab work. There was a lot, a lot, of lab work involved with that. Then my son broke his arm, so we had x-rays, and, you know, just how it goes. We systematically started working on the bills, and we used the snowball effect. Most people have heard of Dave Ramsey if they don’t follow him, they’re kind of familiar with it. Basically, we would pick this bill that we owed the least amount on and try to make extra payments, get that paid off, and then whatever we were paying a month on that bill, we immediately rolled into the next bill that we had. We didn’t take that extra money and put it into our regular spending, we just applied it to the bill and so on and so forth. When I discovered, I was about eight years old, I discovered that people actually wrote books and that was their living because I love books. I love to read. From that time on, when anybody would ask me what I wanted to be, I wanted to be an author, so I started writing books when I was in grade school. I got to do the Young Authors Program. Anything to do with writing, I’ve just been fascinated with. I actually thought I was going to start out being a historical fiction author because, you guessed it, I love historical because it’s back in the pioneer days, and I love stories. I think stories are such an intricate part of who we are. I think we learn so well from stories, and I just adore stories. Did you get that? I initially started the blog because I learned that if you wanted to get published and have books out, that you ended to have some type of platform or a way to reach people who are interested in what you wrote about. I thought, “Well, I’m writing about wagon trains and way back in the day and Dutch oven cooking and cooking from scratch and they raise their own food and all of this. I’ll start a blog, and I’ll share different recipes or different things that the characters in the books that I was writing with at the time in the era that they were, and then that’ll translate over.” That’s how Pioneering today was born, so this was way back in, I actually believe it was like November of 2011, 2012, so about at least five years ago. I quickly fell in love with sharing everything and discovering new things and connecting with other people. I still kept submitting my work to different publishers. I kept getting rejected, you guys. I just kept getting told no for various different reasons, but I did get a literary agent, and I went to a writer’s conference, and low and behold, one of the editors sent back regretfully that they weren’t interested in publishing my historical fiction at that time, but she had went to my website and she loved everything that I was sharing, and would I be interested in writing a nonfiction book for them. I’m like, “Oh. Well, yes. 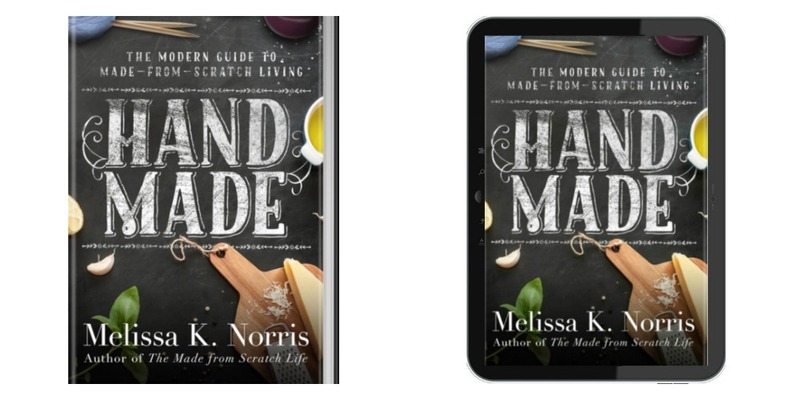 I certainly would,” and that’s where The Made-from-Scratch Life came from, my first book, and then Hand Made: The Modern Guide to Made-from-Scratch Living, which is just releasing, released October 1st, 2017, is basically the sequel. It’s a longer book with all new recipes, over a 100 with tutorials and a lot of snippets from The Great Depression era that we can use now. I love taking the old and marrying it into our modern-day lives with actual usable things that we can do. As the blog grew and I had my second book coming out, I reached the point of not enough me. There was so much that needed to be done that I reached the point that I could not do any more between the pharmacy and the writing and the books, which I loved, and I’m not complaining. I’m, feel very, very blessed, but just to be really be honest with you, everything at home, because we do run a full-functioning homestead with my husband and the two kids, it got to the point where I could not add one more thing to my plate. Then my publisher contacted me and were interested in having me possibly work on some more books or to do some new writing projects. I couldn’t. I said I cannot take on anything else, and I thought … We had really big, long discussion between the both of us and lots of prayer. My whole life, I have wanted to be an author and a writer, and it’s been my passion, and it was coming down to the point where I was going to have to say no because I didn’t have enough of me to go around or enough of me to do it. That’s when I realized that the reality of quitting my day job was something that I needed to look at because it was either to keep the day job and keep working at the pharmacy or to be able to pursue what I really feel God has called me to do and has blessed me with and given me the opportunity to do. Was I going to turn down my passions in order to do the other job? It was really a process. It was lots of prayer, asking God if He wanted me to stay at the pharmacy, then He needed to help me not to have the passion and the drive to do this so that I would feel content wherever He wanted me to be, but if it was to be, then He would let me know that. There was some series of events that unfolded. We really started to look at our finances and to see if that would be a possibility. From the faith side, I really felt, I don’t say this lightly, but I really felt the Lord say to me, “You have been holding on to the day job and what you know as your safeguard, as a safety net, and I’m supposed to be your safety net. I’m supposed to be the one that you look to for your trust.” It was that day that I went in and I gave my two weeks’ notice, officially put in my notice at the pharmacy. Maybe you’re going to be able to sell something. Maybe you will take on some type of a side job or do some moonlighting in order to get some extra money to put towards those bills so that you can get them paid off sooner. One of the things that I had not realized, because a lot of the times, when you do get a loan for something, at the time, you’re looking at the payment, and it’s all broken down for you, and you see how much you’re going to pay in interest over time, but as the months start to go by, you kind of forget or you don’t look at and see actually how much each month you are actually paying in interest. Just interest, we’re not talking principle or anything like that. When I first started all of this, I called and had to get the payoff amounts and really look at everything. I was shocked at how much it added up that we were actually paying every month in just interest alone, which, to me, is kind of like, that’s just wasted money. After figuring out, I realized that once we got everything paid off, that that’s how much extra money would be in our pockets on just the interest alone, not even, of course, that we’re not making those payments. That was a really big motivator, especially when we did maybe want to make some more extra purchases or not being buckled down so much with our budget and our purchases. Really know how much it is you’re spending and to try and look for ways to get enough extra money, even if you can only apply a small amount some months, or more months it may be more, but just to be starting to put aside into, apply some to those payments. It helps. Another thing that I did was I looked at our mortgage payment, and instead of paying it once a month, we went to just every other week. Take the weeks in a year and divide it out, it ends up being, I’m trying to remember now when I did the math, it ends up being one or two extra payments that you make for the entire year, but when I did that, you guys, it took seven years off the life of our mortgage. Seven years just by paying every other week. If you’re able to do that, to break your payment down into every other week instead of once-a-month payments, that was a huge amount of savings. Some of the other things we did is we looked around, and we ended up having a garage sale. We had some items that we weren’t using, so it’s kind of like some of those, and some of them were bigger things that you’re looking, and you’re like, “We’ve had this for two or three years, and we haven’t used it.” We took that money and applied that to extra loans, so that’s another thing that you can do. Of course, I really started to look back at our food, making sure that we were cooking from scratch and not only cooking from scratch because that’s something that I do all the time, I don’t buy box stuff, but a lot of times, you need to take an inventory of what you have. This summer, we really needed to defrost our freezer. Because we raise all of our own meat, and I do can a lot of it, but when you butcher a whole pig and a cow, that’s a lot of meat at once, so we have to have a chest freezer in order to hold all of that. Like I said, I do can quite a bit of our meat, especially if we’re lucky enough if my husband gets a deer and we get venison, then most of the venison gets canned up. There’s very little of that that we actually freeze, but we do have a big freezer, and so I’ll use that for berries and just some things. Some vegetables are not canning candidates, and some of them I don’t like canned. I actually prefer frozen, and because we can so much, then I’ve got the freezer space for that. A long story short, we had not defrosted our freezer in like two or three years, and it desperately needed to be defrosted. We had to defrost it. Took everything out, plus it was right before we were getting ready to butcher our meat chickens, and so we had, I can’t remember now if it was 12 or 15, 12 or 15 meat chickens, so that’s 12 or 15 whole birds that we were going to be butchering that needed to go in the freezer because my whole birds I freeze whole. We went to defrost the freezer. We were quite shocked to realize at how much food we actually had in our freezer because some of it had been shoved behind something else, and when you have a big freezer, at the back of the shelves, it’s really easy to lose things especially if it’s smaller things. You quickly just forget what you have in there. We took a big inventory. I did an inventory of everything that was in the freezer so that we didn’t mistakenly purchase anything when we went to the stores, and it really got us back into meal-planning mode so that I was planning all of our meals from the items in the freeze and not having to purchase additional items to make the meals when you go to the grocery store because it’s so easy when you go shopping. You’re walking through the store, and it may be on sale. Usually, that’s how a lot of us shop when we’re frugal-minded, and it’s a whole food or it’s not processed, but you see something and it looks like. You’re like, “Oh, I want to make … ” whatever for dinner, ” … I’m going to use this,” or, “Oh, man. This is on sale. I’m going to stock up, and then I’m going to get this, and then I’ll make … ” whatever it may be for dinner, and it just varies for seasonal things. That was happening a lot in our house, and it’s one of those things that it kind of gradually snuck up. I didn’t really realize that we were doing that much. Went through my freezer, and I already had a pretty good inventory of all of our canned goods and my dry goods. Freezer was a little bit different story. We went through, and I made a complete inventory of all the items that were in the freezer. We went back to meal planning, started cooking all of our meals out of what we had on hand so that we’re buying very little from the grocery store. I know it seems simple, and it’s something that I talked about doing before, but sometimes, like I said, we don’t even realize that we’ve gotten off track or that we’re not really doing something like we should be, which is what had happened to us. I highly recommend that you go through and take an inventory if you have not done so lately with your freezer. It also helps because we took everything out in order to defrost it, and unfortunately, there were a few items that we ended up having to get rid of that were way, way, way, way too old or had gotten freezer burnt, and that’s another reason to keep an actual inventory of what you have in your freezer. We can make sure that we’re doing food rotation and not throwing anything out. I hate wasting food and throwing it out. That has been very helpful as we’ve been doing our meal planning. For example, we take one of the whole chickens and actually use that in the instant pot, but you can roast it or use it in the slow cooker, and I’ve got that broth that naturally just comes out, and all of that meat. Then we’ll eat the roasted chicken that night. Then pull all of the meat off and then put the carcass, so extra skin and all the bones and everything, back in the pot, throw some vegetables in and make stock, so broth or stock from that, then turn that into another meal. Some of my favorites to do, we did chicken enchiladas, which is one of our absolute favorites, and I did a white sauce, so I used the broth from the chicken and created a white sauce to go on top. If you’ve got home canned tomato sauce or fresh tomatoes, of course, you can make your own enchilada sauce if you want to go the red-sauce route. Chicken and dumplings, oh my goodness, chicken and dumplings is one of our favorite. We’re harvesting a lot of vegetable still out of the garden, so the carrots, and we’ve got our onions going, so that an, great one to use up a lot of our summer harvest that we’ve already got on hand. We love to do a beef stew, which those are great ways to take odd and end vegetables, which is one of the things I love about doing soups and stews, especially at the time of this recording, we’re going into October, some of the cooler months. You’ll find a ton of Great Depression Era tips and a lot of those recipes that I’m sharing with you guys or mentioning by name are in my brand new book, Hand Made: The Modern Guide to Made-From-Scratch Living, but one of the Depression era tips, and it’s packed full of them all throughout there, is making soups and stews is a great way to stretch what you’ve already got or when you have a small amount of different odd and end vegetables. Now, I’ll take the tops of carrots and the odd and end pieces of celery, so the end, and I save the onion peels because those give you gorgeous color on your broth, so those odd and end scrap pieces, I’ll put it in a bag. I’ll put those in the freezer. Those, I’ll take out and use when I’m making my broth. If you’ve just got, say, a couple of whole carrots, like I had a couple of whole carrots left from the harvest, and like I said, it wasn’t enough to turn into a side dish of carrots or anything like that. They were a little bit on the smaller side, but it was just enough to put in a pot of soup. You can take those and put them in a bag and label those for soup. You can slowly add up, and it’s because it’s like if you go through your crisper drawer, usually you’ll find an odder end vegetable here and there. If you just put those in a bag before they go bad, then you’ll have it ready to go because for a lot of us, it’s our grocery shopping that’s the area that we have most play in if we really need to cut back and save money. 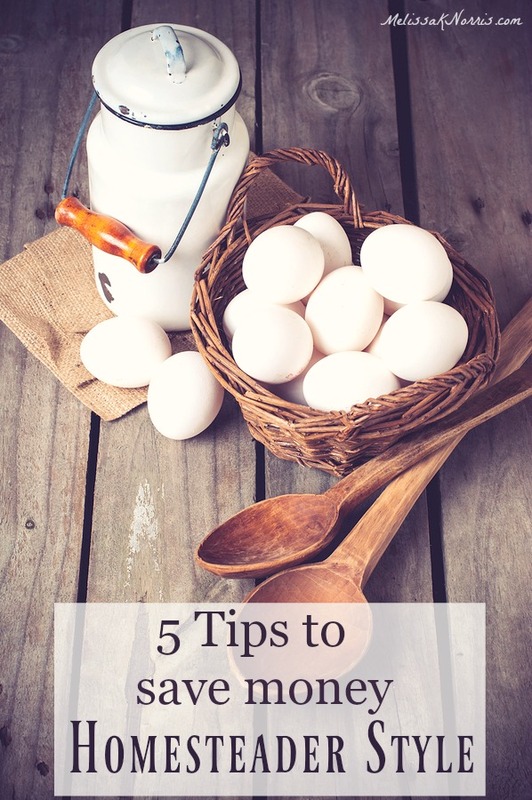 Speaking of saving money and having great tips on being frugal and making foods at home and from scratch. I’m really excited. This is officially launch week, like I shared, of my new book Hand Made.